Our lunch boxes and carry cases are the perfect accessory for school, days out or to keep at home. You can add your name, cool text and whether you're looking for girls' lunch boxes with princesses or boys' lunch boxes with dinosaurs on, we have a great range of free inserts to personalise kids lunch boxes for all ages and tastes! The great thing about our children's lunch boxes is whenever your child decides that they no longer like the image on the front; they can simply remove the flexible front cover and insert a new favourite picture. The anti-bacterial protection on a Kidzpod lunch box kills 99.9% of bacteria ie. E.coli and Salmonella. Anti-bacterial protection is added to the Kidzpod lunch box at the time of manufacture. Unlike a lunch bag, Kidzpod lunchboxes stay fresh and are odour and germ-free. The antibacterial protection ensures your kids' lunchbox stays germ-free, keeping it clean and fresh for longer. Designed with a smooth interior and no internal stitching like a kids' lunch bag - A quick wipe out and you are done! As parents you will understand how difficult it is to thoroughly clean your child's fabric lunch box. Food will often build up in the stitching and corners of your children's lunch boxes which is simply unhygienic. Certainly, the last thing you want is for your child to be tucking into their lunch contained in a lunch box encrusted with remnants of old food. Insert your favourite designs in the front panel! We know what it's like: one week they want a Star Wars lunch box or a Moshi Monsters lunch bag, next, it's Manchester United, Chelsea or One Direction. With a Kidzpod kids' lunch box, it can be all of these and more. 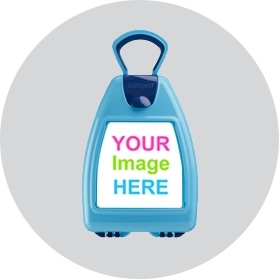 For those who want to be more creative, why not design your own lunch box picture? You can change your picture or image as often as you like. With the help of favourite characters, our personalised lunch boxes for girls and boys are unique and individual. Our children's lunch boxes are excellent quality and designed to last. Easy to clean for parents and loved by the kids. The Kidzpod comes with two free ice packs and delivery is completely free of charge! An anti-bacterial, easy to clean lunchbox & carry case you can personalise.